In 2010, Guangdong Entry-Exit Inspection and Quarantine Bureau (GDCIQ) implemented a management evaluation system for export enterprise. 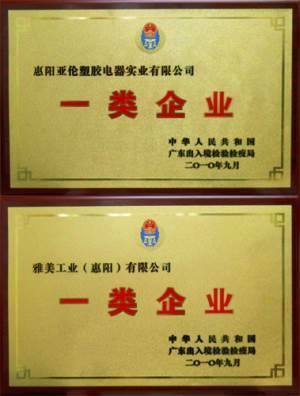 Huiyang Allan Plastic & Electric Industries Co. Ltd. and Artreal (Huiyang) Manufacturing Ltd., both subsidiaries of Allan International Holdings Ltd., are among the first eleven Huizhou enterprises classified as “FIRST CLASS ENTERPRISE”. Being GDCIQ’s highest credit rating enterprise, our export goods will enjoy customs clearance privilege including exemption from customs examination, simplified documentation, credit supervision, etc., which significantly improves customs clearance efficiency.